Cut out one little flag shape from white construction paper. Use the first flag as a stencil to draw 5 more flags that match the first one and cut them out. 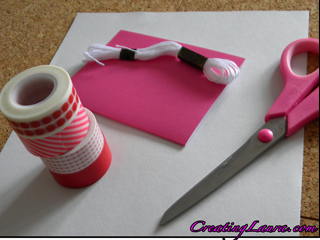 Cover each little flag with washi tape by placing the flag on the sticky side of the tape and cutting around it. Use a push pin to make 2 little holes in the top corners of a flag. Thread embroidery floss through the little holes. Repeat steps 4 and 5 with all the other flags so they are all strung together on a line. Tape the ends of the embroidery floss to the back and inside of the card. 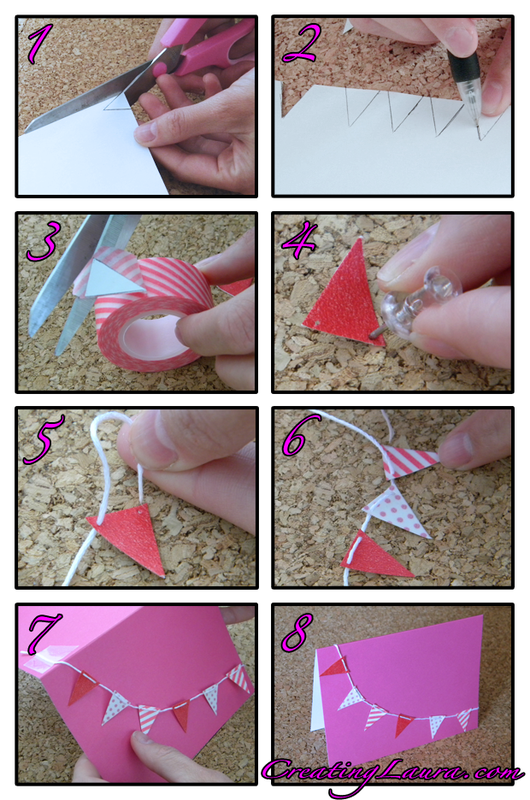 Place a loop of tape on the back of each flag to stick it down on the card. 1. 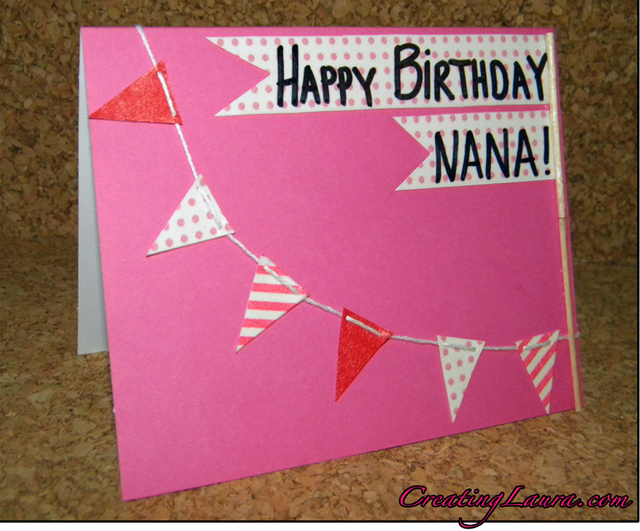 Stick a long strip of washi tape onto the white construction paper and write the card's message on it. (I had my awesome big sister do this part for me because her handwriting is significantly better than mine.) If you have stamp letters, I think it would also look really great to stamp your message instead of writing it. 2. Cut out the message in the shape of a long flag. 3. Glue the long flag message(s) to the upper right hand side of the card. 4. Cut off the pointy ends of 2 toothpicks, then glue them together on the edge of the card so they look like a flag pole. 5. Cover the whole back of the card with washi tape so that you cover up the place where you taped the end of the embroidery floss to the back of the card. 6. 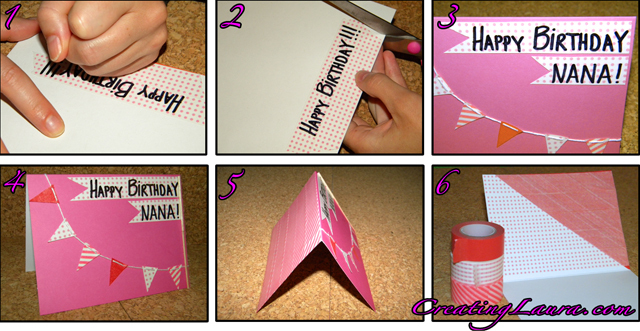 Also cover the upper inside part of the card for the same reason that you covered the back. 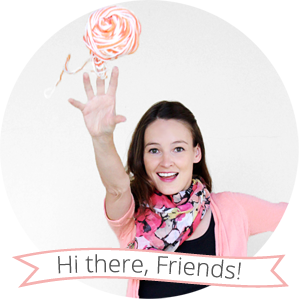 Now you should have a fun, handmade card to write in and mail! I really love this clever design. It's so cost effective to make such a beautiful card. The DIY paper lantern is great!! 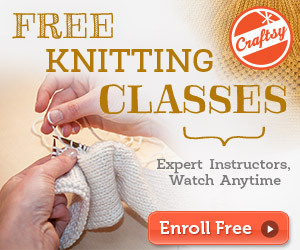 I wish i would've found this tutorial last year, i would totally make them for my wedding. But i can totally do this for my apartment project. Thanks for sharing! You're welcome! I'm hoping to make one soon also. They're just so fun and festive looking.